The Egyptians mesmerized the ancient Greeks for scores of years. The Greek literature and art of the classical period are especially thick with representations of Egypt and Egyptians. Yet despite numerous firsthand contacts with Egypt, Greek writers constructed their own Egypt, one that differed in significant ways from actual Egyptian history, society, and culture. 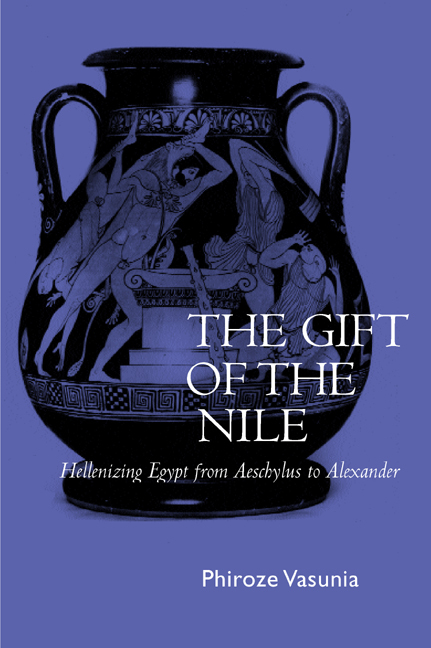 Informed by recent work on orientalism and colonialism, this book unravels the significance of these misrepresentations of Egypt in the Greek cultural imagination in the fifth and fourth centuries B.C.E. Looking in particular at issues of identity, otherness, and cultural anxiety, Phiroze Vasunia shows how Greek authors constructed an image of Egypt that reflected their own attitudes and prejudices about Greece itself. He focuses his discussion on Aeschylus Suppliants; Book 2 of Herodotus; Euripides' Helen; Plato's Phaedrus, Timaeus, and Critias; and Isocrates' Busiris. Reconstructing the history of the bias that informed these writings, Vasunia shows that Egypt in these works was shaped in relation to Greek institutions, values, and ideas on such subjects as gender and sexuality, death, writing, and political and ethnic identity. This study traces the tendentiousness of Greek representations by introducing comparative Egyptian material, thus interrogating the Greek texts and authors from a cross-cultural perspective. A final chapter also considers the invasion of Egypt by Alexander the Great and shows how he exploited and revised the discursive tradition in his conquest of the country. Firmly and knowledgeably rooted in classical studies and the ancient sources, this study takes a broad look at the issue of cross-cultural exchange in antiquity by framing it within the perspective of contemporary cultural studies. In addition, this provocative and original work shows how Greek writers made possible literary Europe's most persistent and adaptable obsession: the barbarian. Phiroze Vasunia is Assistant Professor of Classics at the University of North Carolina at Chapel Hill. Appendix: Fragmentary Greek Historians on Egypt, to 332 B.C.E.